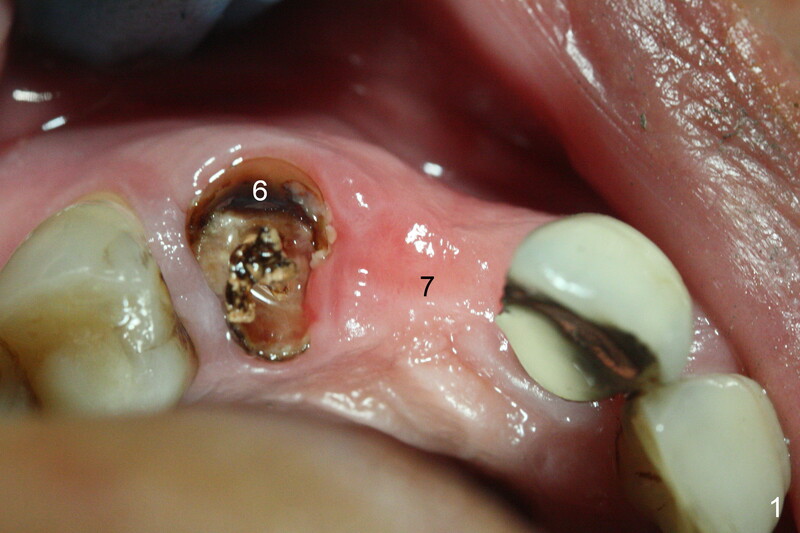 When the bridge is sectioned between #7 and 8, the tooth #6 is found non-salvageable (Fig.1). Incision shows the atrophic buccal plate at #7 (Fig.2 arrowheads); to prevent the same feature from happening at #6 with thin buccal plate, the most buccal portion of the root is preserved (socket shield (Fig.2-4: *)). 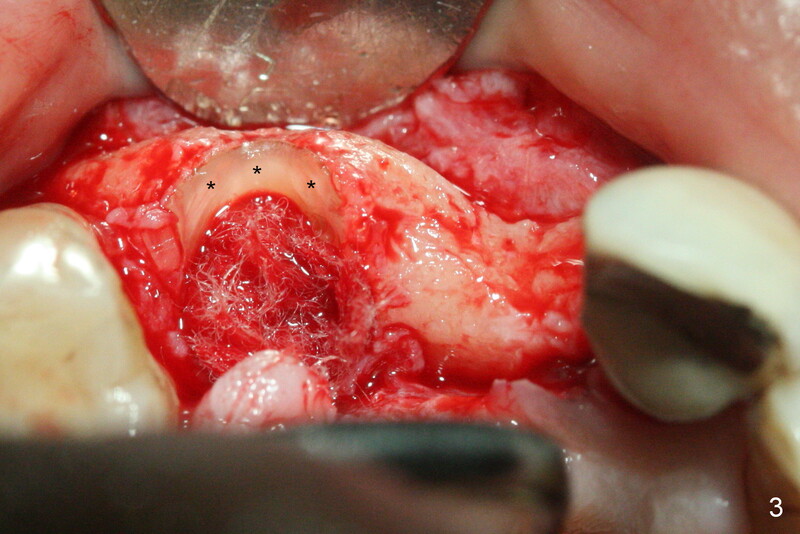 The initial osteotomy is established in the palatal slope at #6 (Fig.5 circle) with 1.5 mm drill (Fig.6,7). 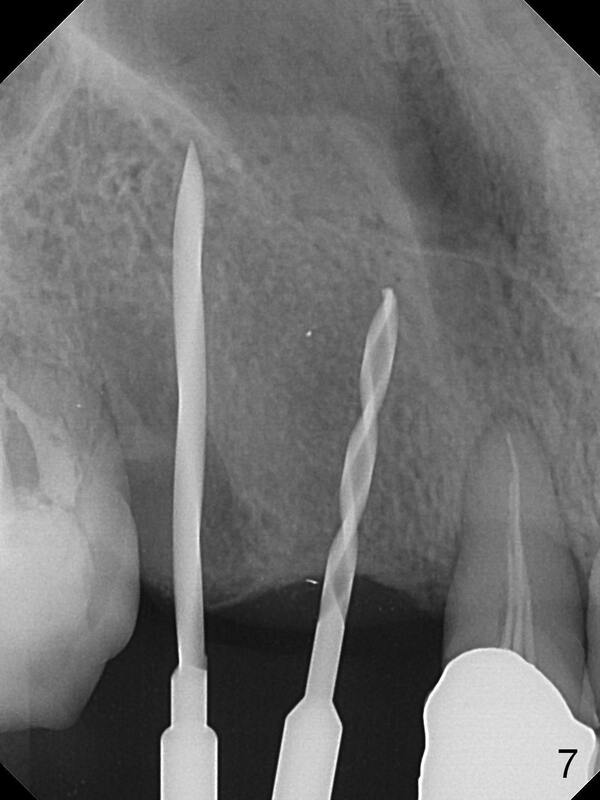 A portion of the root is visible in Fig.6 (arrowheads). 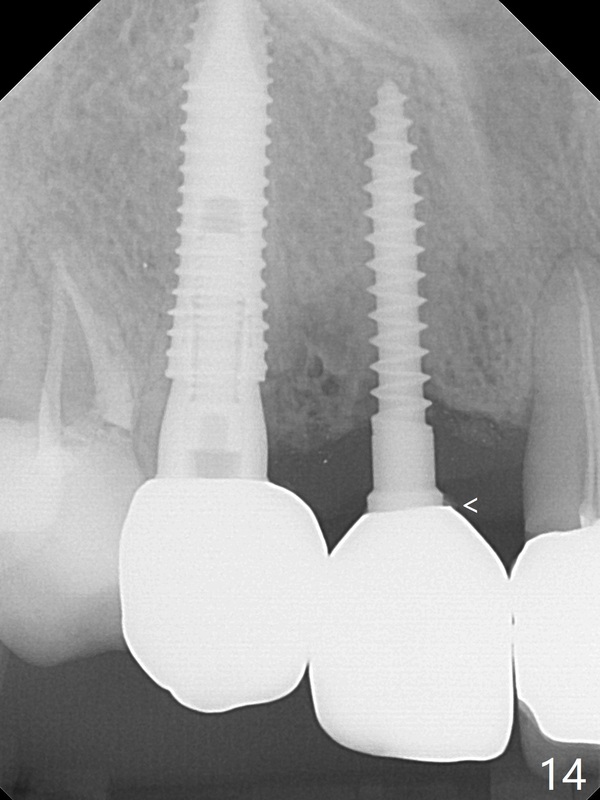 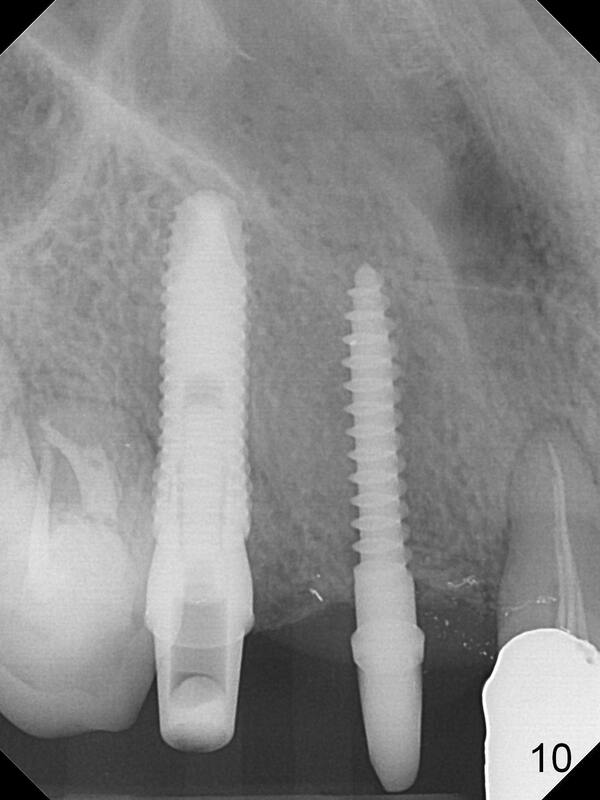 After sequential osteotomy with 2 mm, 3 mm (Fig.8) and 3.2 mm drills, a 4x15 mm implant is placed (Fig.10). 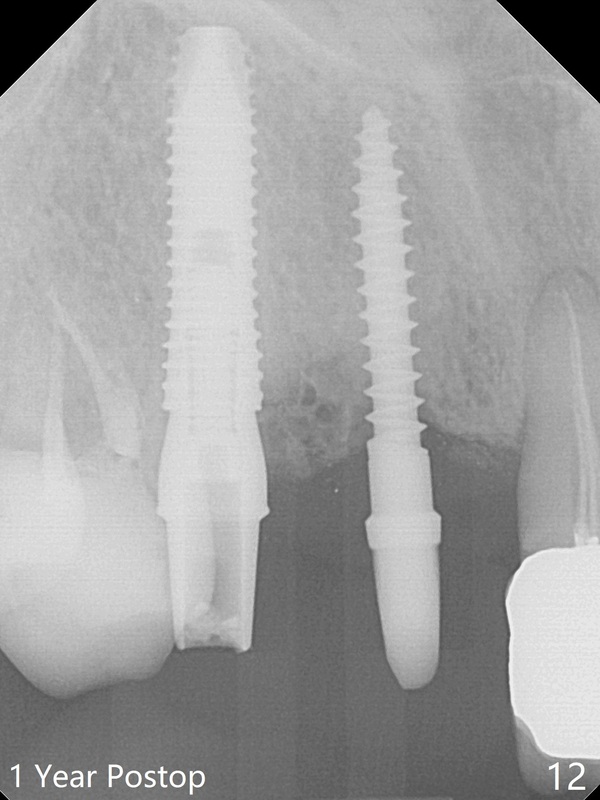 To accommodate the cross bite, the coronal portion of the implant (Fig.9 white circle) is positioned close to the socket shield. 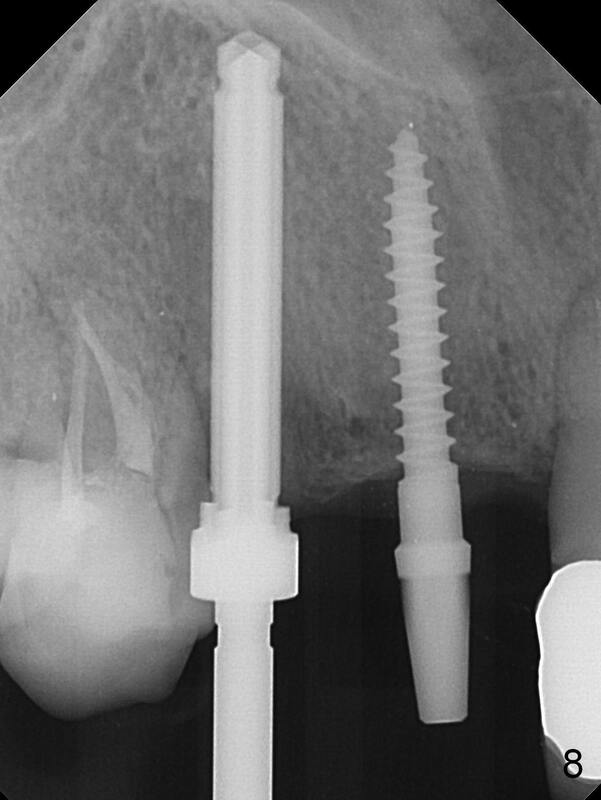 It appears that the shield prevents the implant from encroaching the buccal plate. 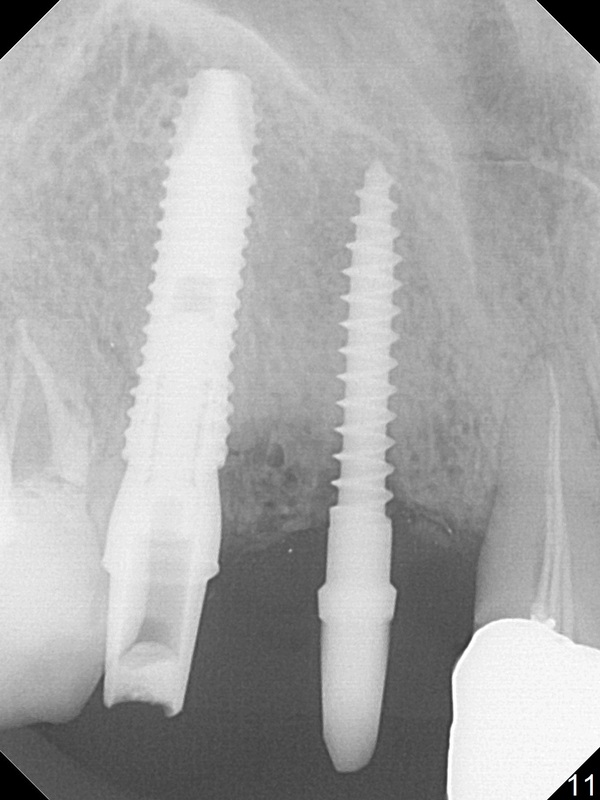 Since the ridge at #7 is ~ 4 mm, a 2.5x14 mm 1-piece implant is placed (Fig.8) after 1.2 mm (Fig.7), and 1.5 mm drills at 12 mm and 2 mm drill at 8 mm. 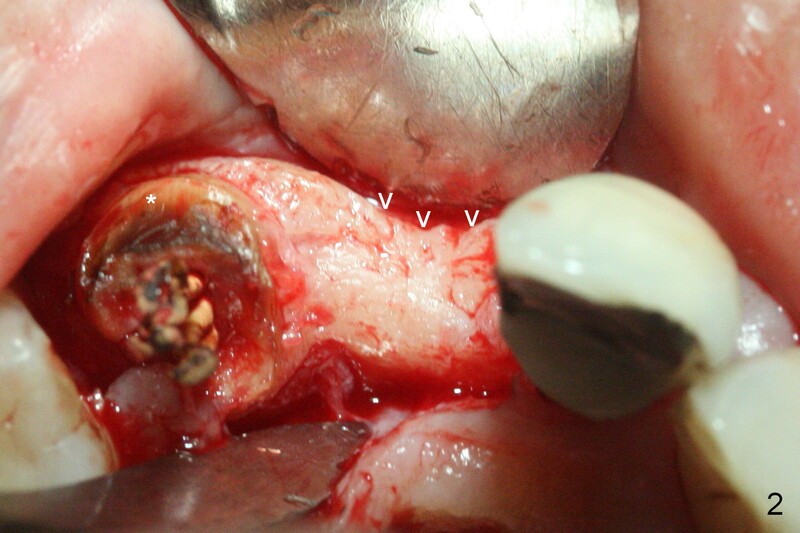 Later the implant is placed deeper (Fig.10). 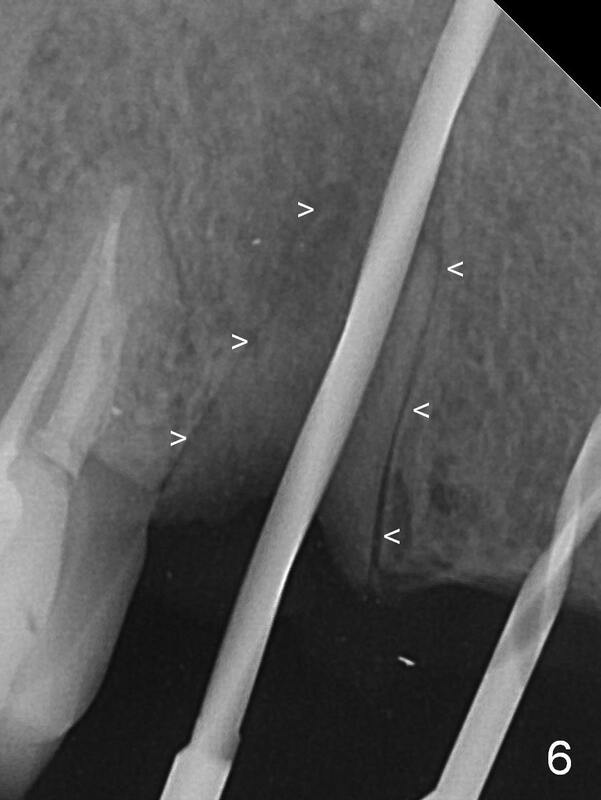 There is no bone loss 7 or 12 months postop (Fig.11,12). 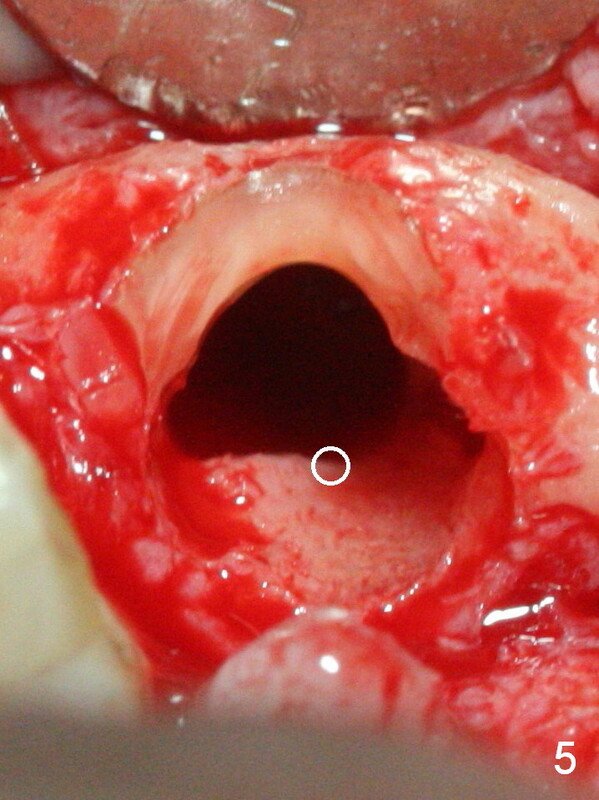 After Diode gingivectomy, there is papillary formation (Fig.13). 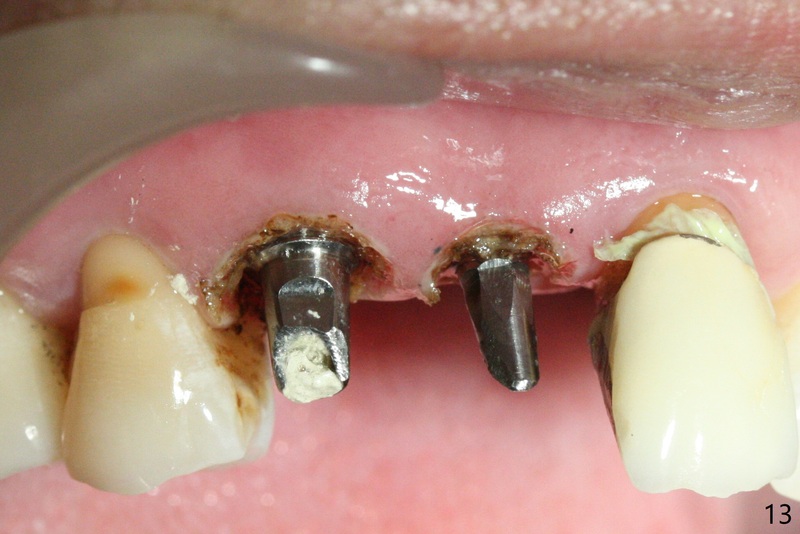 No provisional is provided after impression (with the abutment torqued at #6) for oral hygiene. 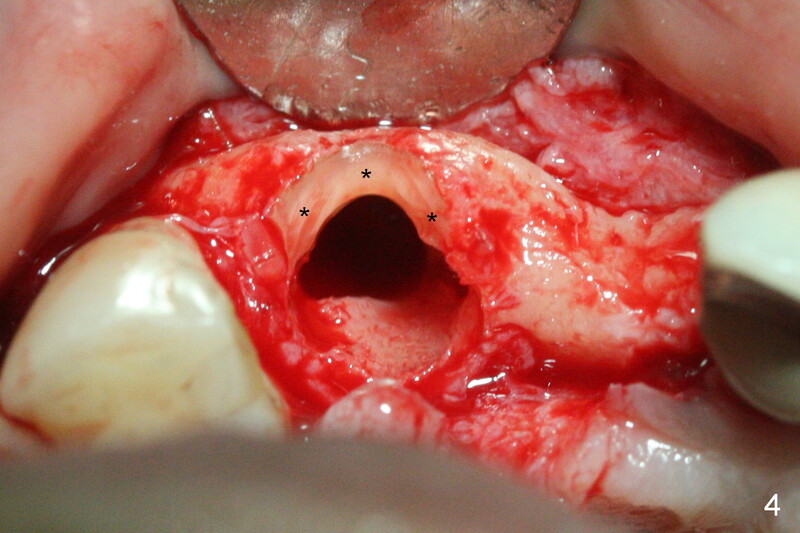 With access holes at #6 and 7, crowns are bonded with minimal residual cement (Fig.14 <, which is removed later).